Often, urban farming startups focus on bringing food options to underserved communities. In the case of The Growing Home and its latest venture, Sarvodaya Farms, the community in question is educated and affluent. After interning on a sustainable farm in India, Rishi Kumar wanted to bring his experiences back to affluent Diamond Bar. He is now offering his well-heeled neighbors a different flavor of the good life. With chickens for eggs, and compost and bees for honey, Kumar is bringing the world of locally grown to a community that doesn’t have to think about self sufficiency in the same way many American communities do. 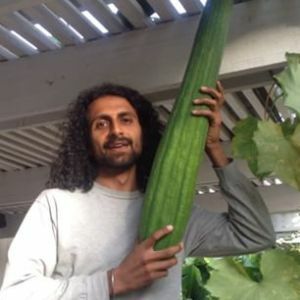 In 2008, Kumar killed the carpet of green grass surrounding his home, transforming it into an urban Mecca of fresh fruits, exotic vegetables and rediscovered farming techniques. In Kumar’s mind, integrating sustainability into affluent environments is a critical part of raising awareness. The Growing Home is comprised of a “sub-urban” growing model utilizing the small space of the urban lot for home food production. The house is an educational facility as well as a residence. The Growing Home also operates a private, fee-based growing club. Since Kumar opened his home with classes, workshops, potlucks and gardening lectures, the neighbors have responded positively. The yard offers fruits and vegetables of every kind and demonstrates planting techniques. It also features a swale, or free-flowing open water trench, as part of a rainwater collection system. That’s an important part of creating landscapes that are more resilient to southern California’s drought conditions. “We’re really trying to tighten up on water use,” says Kumar. But Kumar’s activities are not solely restricted to his affluent neighborhood. For the last six months, Kumar has used club funds and workshop fees to develop a donated piece of land in neighboring poverty-stricken Pomona called Sarvodaya Farms. The land was donated after the owner of a nearby business, Amy’s Farm, heard of the Growing Home and chose to donate the land rather than develop it himself. Sarvodaya Farms currently offers farm tours and “U pick” farm stand days. As the Pomona site finds it footing, Rishi is changing his growing club to be more inclusive, offering members-only videos, recipes and articles to the wider public, and changing club membership into a form of small business sponsorship. Kumar hopes to create additional commercial plots in the near future to encourage economic sustainability for his Diamond Bar business while offering local farm fresh products to neighboring Pomona.